UN Secretary-General Ban Ki-moon on Monday urged the international community to lift its sanctions on Myanmar. The head of the United Nations has urged the international community to lifts its sanctions on Myanmar. 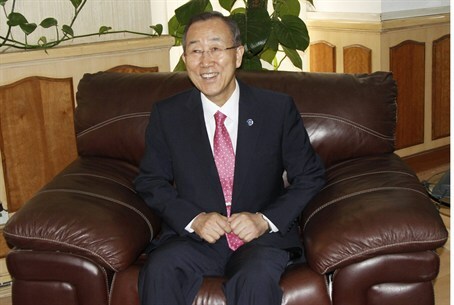 UN Secretary-General Ban Ki-moon on Monday told the country's parliament, in a speech considered the first ever delivered by a foreign national before the nation's legislative body, that the world should "match the ambitions of the country's people for democracy and change." However, the UN chief also urged Myanmar to deal with "difficult issues," including the resettlement of displaced communities, security guarantees for ethnic and political groups, and the release of all political prisoners. Ban has said he is visiting Myanmar now because there is "an unprecedented opportunity" to help democratic change at this "critical moment." It is his third visit to Myanmar as secretary-general, but his first since a 2010 general election helped install a nominally civilian government. Prior to 2010, Myanmar was ruled by a military junta that came to power in a 1962 coup. The election that brought reforming campaigner President Thein Sein to power left the military in firm control but signaled a desire for political reconciliation. German Foreign Minister Guido Westerwelle and EU foreign policy chief Catherine Ashton are also visiting Myanmar this week. Since January, the country has hosted British Prime Minister David Cameron and the foreign ministers of Britain, France and Canada. The visits have heralded an easing of sanctions imposed by their governments because of the previous military junta's repressive policies. In Ban's speech to the lawmakers, he said Myanmar's recent dramatic changes have inspired the world. Ban called on the international community to lift, suspend or ease trade restrictions and other sanctions and recognize that "Myanmar needs a substantial increase in development aid and foreign investment." He noted ongoing military operations against the Kachin ethnic minority in northern Myanmar and called for the government to observe its ceasefire there.